The solution, called CuePath, can be used potentially for different drug models (polypharmacy, rational polytherapy, concomitant drugs, variable dosing regimens, and dosing intervals). 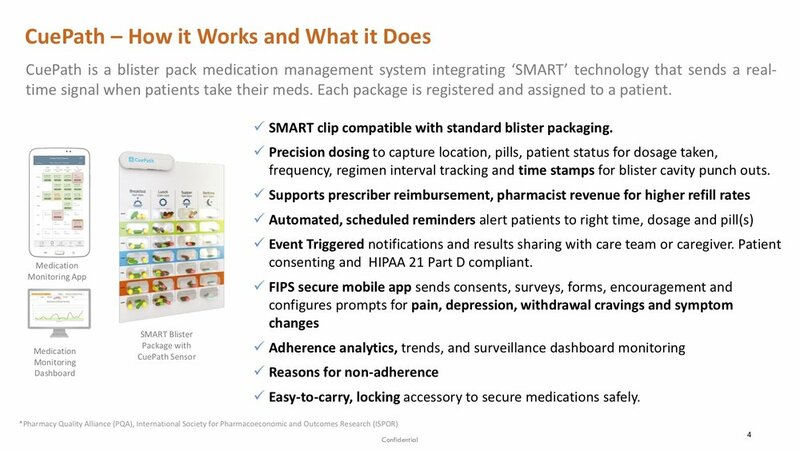 Potential use cases include painkiller medications (Tramadol, etc.) Medication Assisted Therapy (MAT), polypharmacy prescriptions (Alzheimer’s, Heart Failure, Oncology etc.) and other regimens (Hepatitis C, Tuberculosis, Chronic Kidney Disease, HIV/AIDS, Schizophrenia). 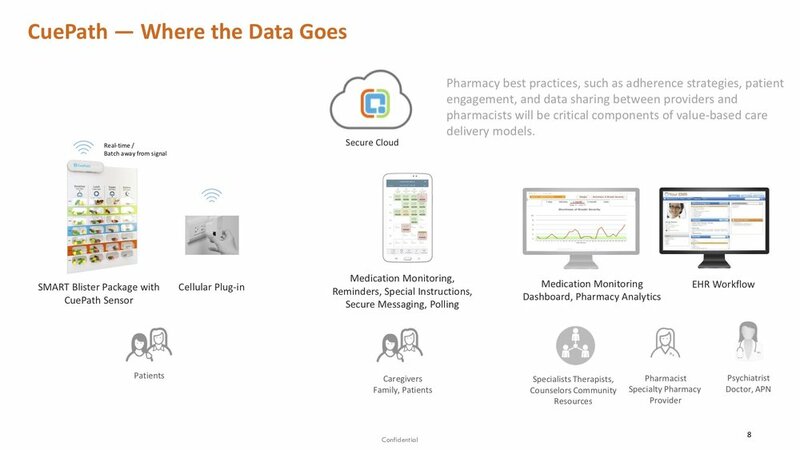 Does this solution create the intended benefits for patients, caregivers, prescribers, nurses, and pharmacists? Which market segment is most attractive for the solution (specialty pharmacy, payers, pharmaceutical manufacturers, clinical trials, long term care, packaging manufacturers, etc.)? 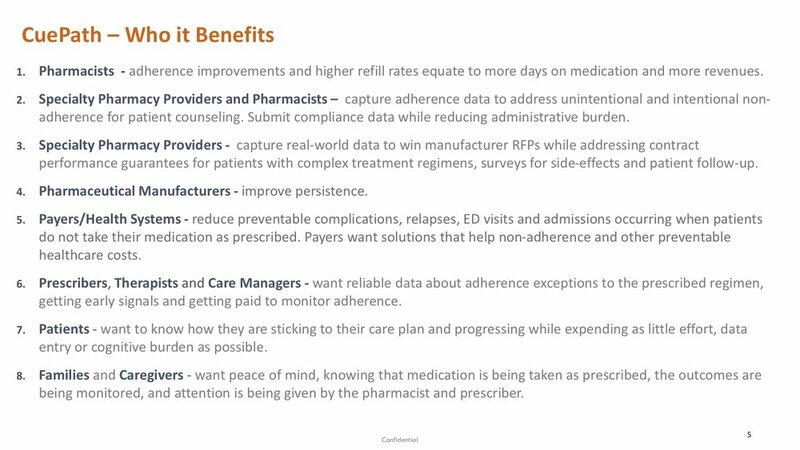 If the solution improves adherence and persistence, who should pay for the solution and what is the value? 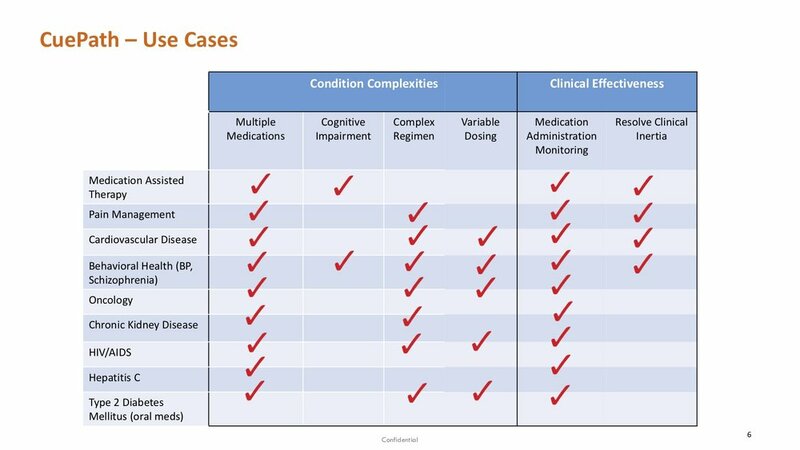 What types of patients do you see benefiting from this solution? Does the contemplated solution feature set have a near-term path to viable commercialization? What features are missing and what features should be dropped? If you are willing to help, one or more representatives from VenAdvisory will interview you, asking questions about how CuePath might be used for various customer market segments. During the interview, we will refer to a visual artifact at the top of this page.